In this blog post I’m going to be reviewing the new Single Length Sterling Irons®. But to begin with I think it would be a good idea to look at a bit of a history of single length irons. First, what are single length irons? Single length irons are all the same length. So your 5 iron is the same length as your wedge. Also, your 5 iron is the same weight as your wedge. Your 5 iron is the same lie angle as your wedge. Your 5 iron is the same swing weight as your wedge, etc., etc. The only difference is the loft. 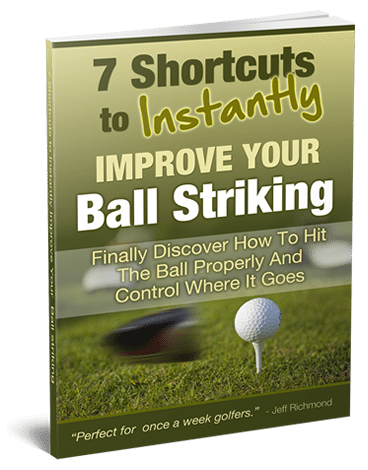 On one hand that makes complete sense because you only have to learn and groove one swing, one ball position, one swing plane etc., etc. On the other, how the heck are you going to get the proper distance gappings and trajectory heights with a setup like that? When I was doing research for this review I read in a number of places that hickory golf clubs were generally all custom made and made to one length. But the mass produced hickory golf clubs were different lengths to make it a one size fits all type of deal, and then that exploded when the steel shafts came out. In the early days of golf it was very much a rich person’s sport because it was expensive to get a set of custom made hickory golf clubs. Mass production of steel shafted golf clubs changed all that. And mass production created a one size fits all, different length iron mind set, which stuck until the 80’s. In the 1980’s Tommy Armour Golf came out with a set of irons that were all the same lengths, but obviously that never took off. The main reason was because there was a big problem with single length irons…. The long irons flew too low and the short irons flew too far. So in effect the distance gapping was screwed up. 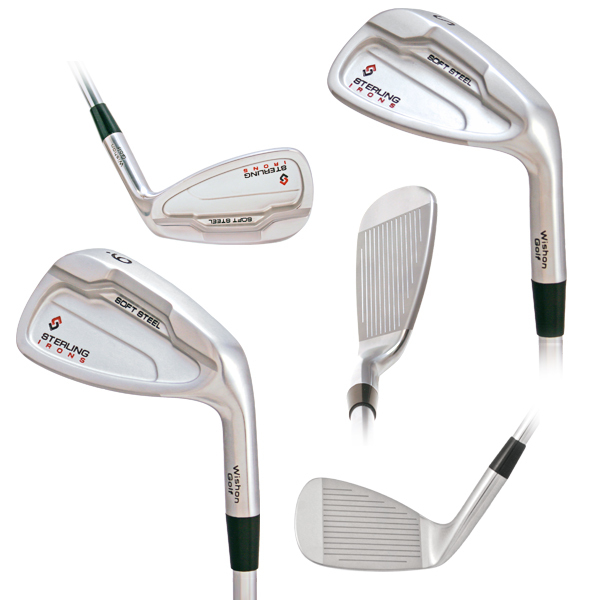 Since the Tommy Armour EQL set came out there have been other small companies producing single length irons. But from everything I’ve read they have not really adequately solved the problem of trajectory and distance gapping. Recently the single length debate is back on the table again with Bryson DeChambeau using a single length iron set made from Edel Golf. Here’s what Bryson did as an amateur using a single length iron set. In 2015 Bryson became just the fifth golfer in history to win both the NCAA Division 1 championship and the U.S. Amateur in the same year. The other golfers to achieve that were Jack Nicklaus, Phil Mickelson, Tiger Woods and Ryan Moore. That’s why this really is even a topic at the moment. But the single length irons Bryson uses are very, very much custom built for him. There’s probably no other golfer that could play with those irons and expect to get great results like he does. And you can’t just adjust your current irons to be single length because the distance gapping would be totally screwed up. So that begs the question… can single length irons ever be mass produced for the average golfer so they will actually work for most golfers? The Sterling Single Length Irons claim to be the answer to that question. Let’s get into the review to see if they will or not. The Sterling Irons® are a collaboration between Jaacob Bowden and Tom Wishon. First, here’s a bit of background about Jaacob Bowden. Jaacob is a Professional Golfer who was an average-length hitting 14-handicap computer engineer. Then in 2003 Jaacob quit his job, took his savings and moved from Kansas to California to pursue a golf career at age 27. He has since won the Pinnacle Distance Challenge with a televised 381-yard drive, won multiple qualifiers for the World Long Drive Championships including a 421-yard grid record drive, made cuts in numerous tournaments around the world with rounds in the 60s and 70s, and finished fifth at the Speed Golf World Championships at Bandon Dunes. Jaacob also holds the championship record for golf score with a 72 in 55 minutes and 42 seconds using only 6 clubs. 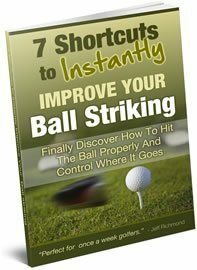 In 2007 Jaacob started playing with single length irons from a company called 1 iron golf. But in 2010 with the rule change on iron grooves it meant that he could no longer play with those irons in tournament play, as they were illegal. To try to solve that problem, in 2011 Jaacob asked both Tom Wishon and David Edel if they’d be interested in partnering with him to create a single length set of irons, but both of them said no at that time. But in 2013 Jaacob once again asked Tom Wishon and then he said yes. This was before Bryson DeChambeau became well known. So this has nothing to do with him or trying to cash in on his success with using single length irons (but I bet if Bryson wins a tournament you’ll quickly see some major OEM try to do that). The Sterling Irons® are the result of Jaacob’s long term use of single length irons, and his knowledge about their pros and cons up until 2013. After Tom Wishon agreed to working with Jaacob in 2013, Jaacob went to work with Tom to create the Sterling Irons. Technology, which specializes in the design of original, high-end custom golf equipment designs and club fitting research for independent custom club makers worldwide. If you search Tom Wishon you’ll see he gets a ton of respect online. I have a set of Sterling Irons so let’s go through the list to see if they achieved what they wanted them to. The irons look very nice. I generally like a blade type of look on my irons but these look fine. They have a biggish face which makes them appear very easy to hit. The build quality on these clubs is very good. They don’t look like cheap clubs and when you hit them they feel as good as any iron I’ve hit, and I’ve hit almost every iron out there. But more on that in a few minutes. Let’s now look at the distance these clubs hit the ball. I tested all of these irons against my current set of irons and I was shocked to find that they all go pretty much the exact same distance as my current irons. There was a few yards distance difference here and there, but nothing major. Just 1 degree weaker with the 5, 6, 7, 8 and SW… and that’s it. That 1 degree difference is not going to do much in terms of distance differences over a normal set of golf clubs. And as I said, I found no real difference in distance in a side-by-side test with my normal clubs and this single length set. In fact, the longer single length irons went a fraction farther than my long irons. The heights throughout the bag were similar as well, and the stopping distances were virtually identical. When you get a set of Sterlings you’ll quickly find that the 5 to 7 iron have a different sound to them. That’s because those irons have a steel alloy insert to help you get more distance. It’s like a spring face in drivers and fairway woods. It’s because of that insert that those clubs give off a higher ping noise when hit. It’s not distracting, but just takes you by surprise if you don’t know about it, which I didn’t when I got these clubs. It’s that insert that allows the longer irons to be hit with the same distance, or even longer distance, than a variable length iron. So the distance problem has been solved, as there was no loss of distance with the longer irons and the height was fine. And the shorter irons were good as well. So the distance gapping issue is well and truly solved with these new single length irons. Let’s have a look at the customizable options. 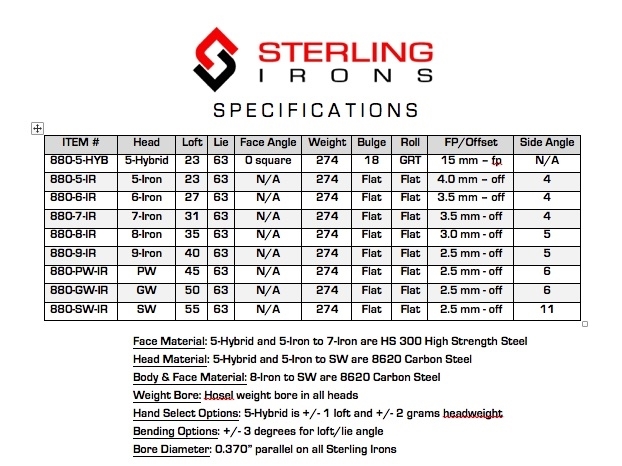 When you go here to order Sterling Irons® you’ll see they have a HUGE range of options for you to choose from. For example, you get 12 graphite options, 4 steel options, 2 length options, 7 lie angle options, 12 swing weight options and 10 grip size options. Even if a big brand comes out and tries to compete with these irons, they will be hard pressed to have all of those custom options available. So with all that being said, let’s get to the elephant in the room. The short irons are going to feel weird because the shaft is too long, and the long irons are going to feel weird because the shaft is too short. When I ordered these irons I chose the 37 inch option, which is about a 7 iron length. The reason I did that was because I like to use long irons over hybrids, so I wanted the longer shaft. If you don’t use longer irons then I would recommend the 8 iron length option. As you can see, there’s hardly any difference in most of the irons. The 6 and 8 Sterling irons felt pretty much exactly the same as my clubs. The 9 iron through to SW felt a bit longer, but I actually liked that because it felt like I could get the ball to the hole easier. But I know what you’re thinking… what about little pitch shots, bunker shots etc.? Well, I just simply gripped down the grip towards the bottom when I wanted a bit more control around the greens. I don’t normally do that, but with the Sterlings it felt natural and it had a nice side benefit…. I actually felt like I had more control because I was gripping down on the club. In fact, I’m gripping in much the same place as I would be if I was griping my normal SW, but because the club shaft is longer by gripping down it felt like I had more touch and control. I guess it’s sort of like using a counterbalance putter where you have some grip sticking out the end. So I had no issue with 6 iron to SW in adjusting, and I don’t think many other golfers would have a problem adjusting either. The problem came with the 5 iron. But it’s not really a problem with the 5 iron, it’s a problem that there is nothing beyond that. As I have said, I like hitting long irons. But the Sterlings stop at the 23 degree 5 iron. Speaking to Jaacob Bowden about that he said they did that because this set was designed for the average golfer who swings their driver between 85 – 105 mph. And they thought these golfers would not want a 19 degree 4 iron. Since they have released these irons they have found a lot of people are wanting a 4 iron, so they are getting one made and it is supposed to be ready for release in October/November. Now obviously there is never a perfect set of clubs, and these clubs are not perfect and will not be right for everyone. Jaacob and Tom designed these for the average golfer. However, I am a better than scratch golfer and I’m using these irons and find the irons perfectly acceptable. But if I’m honest I would prefer a bit more of a players irons. Talking to Jaacob about this he said in future they may look at creating a more players set of irons if the success of these first irons warrant it. The same is true with a left handed version which is not available at this time. These clubs don’t look as pretty as some Mizuno blades. But they are easier to hit and make the game easier because the shaft is all one length. Are you going to suddenly start shooting in the 60’s with these irons if you’re an 80’s shooter? But it wouldn’t surprise me at all if your average score drops because you get these irons. You don’t need me to tell you that golf is a hard game. Anything we can do to make golf easier, I believe we should do it. And these single length irons will help MOST golfers make the game easier, because you only have to master one club with the same flex, lie angle, weight and length. 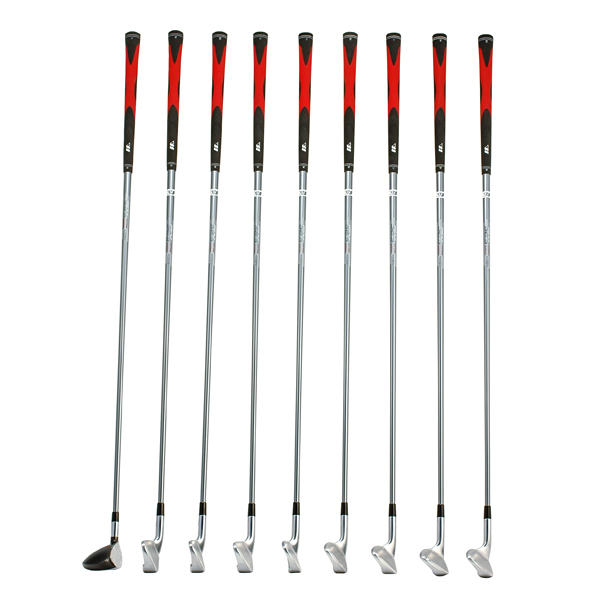 And I would say that these clubs could be used from golfers in the scratch to beginner range. These irons are hittable for everyone. So where can you get a set? Well, you can get professionally fitted for a set by going to a Tom Wishon approved club fitter. Or you can purchase a set online by going here. When you go to the website online you can either choose the specs you want or you can be recommended a set after you answer some simple questions. When you receive your set you’ll soon see that the build quality is very good. I’ve never tried any Tom Wishon clubs before, but I’m very impressed. I can see why he is so well respected. So there you go. That’s my review of the new Sterling Single Length Irons. As you can tell, I’m very impressed with them. I’m using them and very thankful they have sorted out the earlier problems to single length irons. I’m sure as time goes on better single length irons will become available (e.g. players irons etc.) but I’m not waiting. Golf is a hard enough game as it is. It makes sense to me to have one swing, one posture and one ball position and go from there. That’s got to lead to better ball striking consistency, doesn’t it? If you have any questions about these single length irons just shoot me an email. I’ll do my best to answer you or pass you on directly to Jaacob. He’s a great guy. And if you do nothing else after reading this review, go here to look more into the new Sterling Single Length Irons®. Also, watch these video reviews of The Sterling Irons.